During Operation Sahayogi Haat in Nepal on May 12, 2015, the UH-1Y Huey crew of six Marines aboard Vengeance 01 made the ultimate sacrifice while providing critical humanitarian and lifesaving assistance to Nepalese earthquake victims. Off the coast of Oahu, two CH-53E Super Stallion helicopters collided during a night combat training mission on January 14, 2016. All 12 Marines aboard the two HMH-463 aircraft lost their lives in the tragic mishap. During practice for an airshow in Smyrna, Tennessee, on June 2, 2016, Blue Angel pilot Marine Capt Jeff Kuss was killed when his F/A-18 Hornet fighter jet impacted the ground. The August 19 ceremony will include family members and friends of the fallen, active duty service members and Veterans. It will be open to the public. 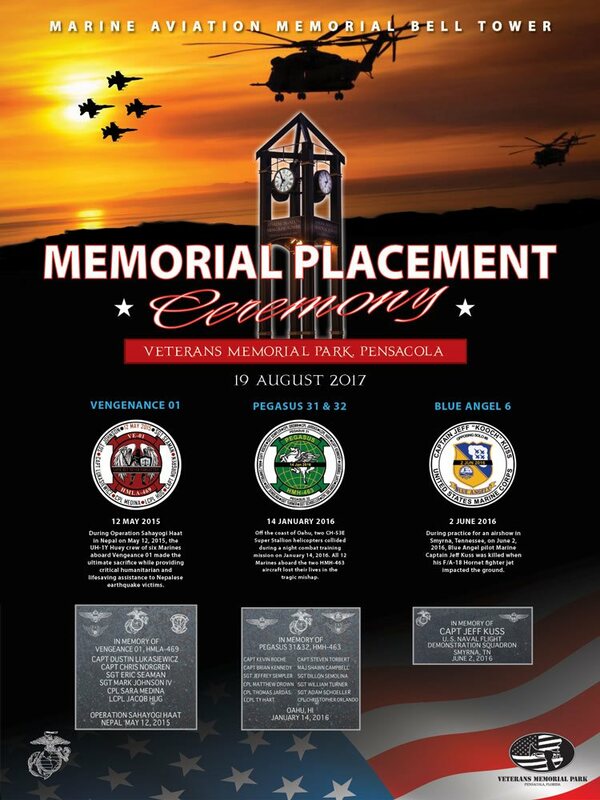 Veterans Memorial Park Foundation of Pensacola President, Captain Butch Hansen, USN ret., will preside over the ceremony, and the keynote speaker will be Col Don Chipman, Commanding Officer of Marine Aviation Training Support Group-23 aboard Naval Air Station Pensacola. The ceremony will include the unveiling of three memorial bricks placed at the base of the Marine Aviation Memorial Bell Tower to commemorate the above losses to our nation and provide a permanent place of remembrance of these fallen Marines. Pensacola’s Marine Aviation Memorial Bell Tower pays tribute to the men and women of America who swore an oath to defend this nation by serving with Marine Aviation in all warfare specialties, including those Marines who have maintained, crewed, controlled and supported Marine Aviation training and operations. The Memorial is dedicated to all who have made the ultimate sacrifice in service to this great nation. The Veterans Memorial Park of Pensacola honors the memory of those who sacrificed their lives in the service and defense of the United States. In showing by example the sacrifice that love and duty sometimes require of a free people, they placed themselves in the deeply grateful hearts and eternal memory of all Americans. Veterans Memorial Park exists as a place of repose for, and veneration of, the spirits of our fallen warriors, a place forever to be kept free of discord and contention.